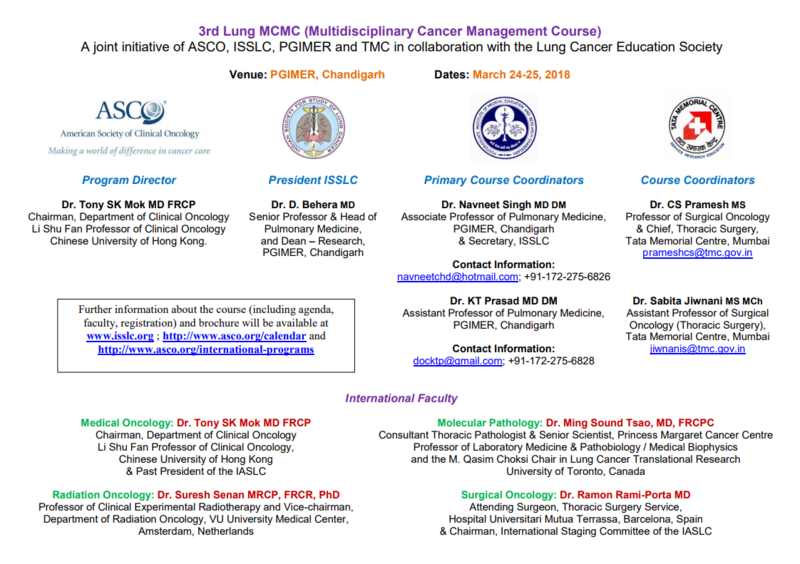 We are pleased to inform you that as a result of the encouraging feedback received from the previous two versions of ASCO-ISSLC LUNG MULTIDISCIPLINARY CANCER MANAGEMENT COURSE (MCMC) – held at PGIMER, Chandigarh (April 2014) and at Tata Memorial Hospital, Mumbai (March 2016), the 3rd version of this ASCO-ISSLC Lung MCMC will be held on 24-25 MARCH 2018 at PGIMER, CHANDIGARH. You would also be happy to learn that PROF TONY MOK, a world renowned medical oncologist, from the Chinese University of HongKong has agreed to be the COURSE DIRECTOR for this MCMC and that he would be coming over in person to participate as one of the ASCO faculty. The list of the other ASCO faculty is provided in the attached leaflet. This year registration for course can also be done online. Payments can be made online and applicants can use Credit/Debit Cards and also online wallets. Payments can still be made offline using bank drafts. ( click here for registration details ). We request you to kindly block the above mentioned dates in your calender and also pass on this information to your friends, colleagues, residents, fellows or anyone else whom you feel might be interested in attending the same. For any queries related to this course, please feel free to contact the course coordinators from PGIMER, Chandigarh or TMH, Mumbai whose names and contact details are provided in the attached leaflet. You may also contact the organizing committee on +91-9888306877 during office hours. NOTE: The conference has been accredited with a total of 8 credit hours of CME (4 credit hours for each day) by the Punjab Medical Council.